With a great deal of anticipation the time had once again come around for tupping. Our new tup, ‘Mac’ has been pacing up and down that fence for the last few weeks, since his arrival, with an array of ewes taking turns to flash their eyelashes at him through the fence. In the past, I had previously fitted a harness onto our tup and then coloured chalks were clipped to the harness which would then mark the ewes as the days went on, but last year, after taking advice, I found another method. I used ‘Raddle’, which is a powdered dye. After mixing the product with vegetable oil it is daubed liberally onto the tups chest and for me it just ensures that he’s not restricted with a cumbersome harness. So, after mixing the raddle in an old beans can, Mac was suitably daubed and ready for action. I enlisted Wendy’s help for the next job because we had gathered all the sheep together to worm them all ahead of their party with Mac. Not all of the sheep were going in with Mac as we have some of this year’s lambs who are too young and three males too, so we needed to sort them out as well during this worming process we were undertaking. We cracked on with the job, getting all of the sheep into the pen. This was the easy bit. Then in small groups we sent them down the race until it was almost full. At that point we shut the gate behind them. 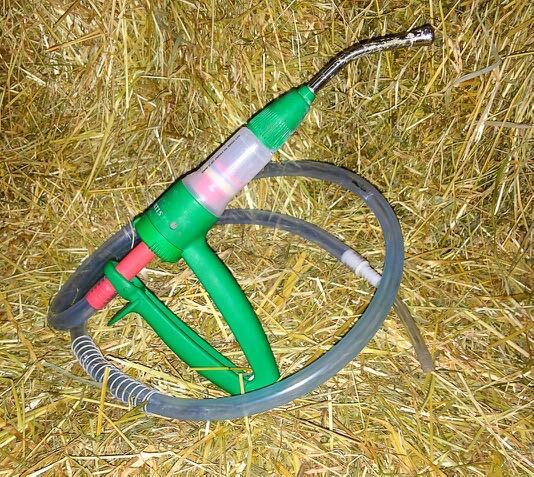 From back to front we then worked our way through each of our woolly companions to administer the dose of medicine into their mouths using a drench gun. By now we have completed this process many times before so the sheep seem to have a good idea of what’s coming. Mrs McKenna and I have things pretty well organised, or so I thought. There we were, down to the last batch of sheep and with only a few left to take care of. I was bent almost double, straddling ‘Delilah’s’ back with her head in my hand, the drench gun nozzle was in her mouth ready to dispense the medication, but when I squeezed the trigger on the drench gun the liquid decided not to behave itself at all and must have hit the back of her throat and shot back out of her mouth and you guessed it, straight into my eye. As you can imagine it wasn’t a good place to be with one eye shut, dripping with medicine and a ewe wedged between my knees, but it appeared that Mrs McKenna for some reason saw the funny side of things, even if I didn’t. It was one of those times you just got on with the job, so I wiped my eye with my shirt sleeve and got the job finished. Throughout the worming process we had been trying to sort the sheep into two groups, the ‘Party’ team and the ‘Not old enough to party’ team. The only problem was that some of the smaller sheep were still able to squeeze under the race fence and so had joined the party team in the field, which thankfully wasn’t the field with the tup. I stood at the gate into Mac’s field and with Wendy sorting the sheep out, I then allowed the party flock through to see Mac and after only a few minutes Wendy had them all sorted. Finally I had time to break off and wash out my messy eye and now I just hope to goodness that Mac is up to the task ahead.